Directions: From Truckee, go on Highway I-80 East 6 miles to Stampede Dam Truckee Road. Turn North and go 10 miles (past Boca Reservoir) to USFS Road 19N69 (Dog Valley Road). Turn West and go across dam, 1 mile to camp. 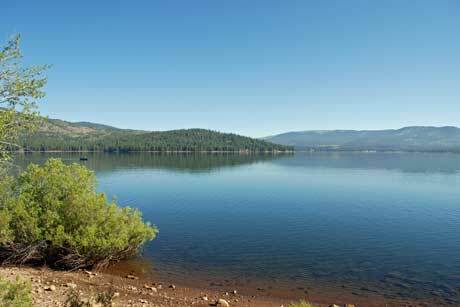 Stampede Reservoir covers 3,400 acres and is heavily stocked with 10 to 12 inch Rainbows throughout the season. Thousands of Kokanee Salmon and Mackinaw fingerlings are also planted each year but ,Stampede is particularly reknowned for some very large Browns that take residence there. The lake is open year-round. For flyfishing, it is best at ice-out when the trout come into the shallows to feed. Flyfish the points between the launch ramp and the dam with Black Woolly Worms (#12) with a sinking line droping the fly to 15 to 20 feet of water and a pull pause strip. When the water warms in May, try the flat area across from the boat ramp. The Summer can become quite iffy since the lake is drawn down to maintain water in Boca Reservoir and the Truckee River.Try Black Ants (#12) and Daves Hoppers(#10). This works well throughout the Summer. However, Fall is another good period to fish this lake. Concentrate on the weedbed areas along the northern shoreline which also contains Springs. Sagehen Creek, between Highway 89 and Stampede,has many beaver ponds and undercut backs which hold large Browns in the Fall and Rainbows in the early Spring while they are making their spawning runs. Use Parachute Adams, Pale Morning Dun, and Elk Hair Caddis. Upstream from Highway 89, there is a spawning area that is closed to all fishing.